For more than 30 years, Southern California-based AFM Safecoat has been the leader in producing environmentally safe, sustainable, and non-polluting products. The AMF line of architectural paints, primers, finishes, and stains are manufactured to emit the least amount of toxicity and contain no formaldehyde. Developed specifically to decrease toxic emissions and prevent harmful indoor air quality in homes, schools, hospitals, and offices, their AMF products are recognized for helping prevent "sick building syndrome." In addition to being "green," AMF products are also durable, long lasting, and available in any desired color. Fullerton Paint and Flooring is one of the largest AFM Safecoat supplier in Orange County. We were also one of the first AFM Safecoat dealers. Customers who want paints, stains, finishes, and/or sealers that are safe for them and the environment come to us for reliable education and guidance, and often end up choosing one or more of our AFM products. AFM Safecoat products are non-toxic, making them the ideal solution for chemically-sensitive people. 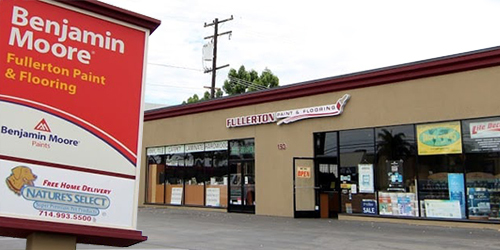 Let Fullerton Paint & Flooring help you find a solution that is non-toxic, non-polluting and environmentally safe for your home or building in Anaheim, Fullerton, Yorba Linda, Brea, Orange, Placentia, or any other city in or near Orange County. We can also ship these specialty products anywhere in the Continental US.